I have two obsessions occupying my time, recently. Skin care. Always. And planning. I got bitten hard by the planner bug and I'm having so much fun with it! It's the perfect excuse for adults to play with stickers, coloured pens and washi tape! I love to sit at my desk with a coffee and a snack and all of my supplies and decorate my weekly and monthly layouts and plan out my days and weeks. Such a nice way to relax, have a little fun and be productive, all at the same time. One aspect of good skin care is taking care of the bod. 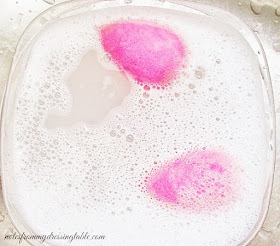 Keeping the skin soft, smooth and hydrated is key, especially as Winter approaches, the temps drop and the humidity and every last bit of moisture is sucked out of your skin! If you are like me and have a few more miles on your tires, dry skin is likely an even bigger concern. A Girl's Gotta Spa! Energizing Citrus Body Lotion can help. With their beautiful assertion that You Deserve to Be Pampered! 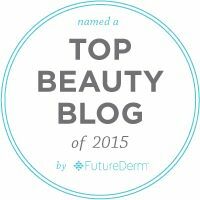 and their mission to create effective, caring products that wrap your skin in comfort. A Girl's Gotta Spa! Energizing Citrus Body Lotion is a lightweight, almost whipped textured lotion that spreads silkily, drops almost instantly into my skin, I don't have to rub and rub and rub forever. I feel velvety, never sticky, greasy or slimy and I can get dressed immediately after application. 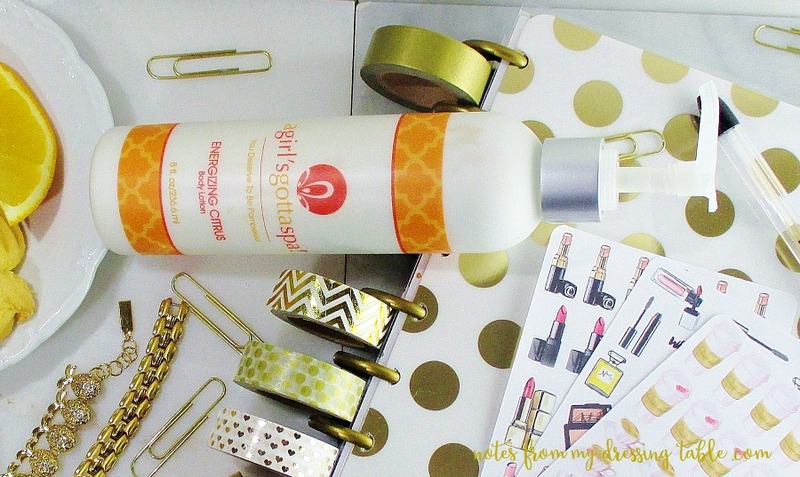 This lotion beautifully moisturizes and leaves me feeling satin soft all over all day long. The light, fresh citrus scent is invigorating and while it lingers for a bit, it is so soft, so gentle that I can easily wear other fragrances without worrying about scent clashing. This lotion is beautiful and I would like a barrel full. Energizing Citrus Body Lotion Ingredients: Purified Water, Olea Europaea (Olive) Fruit Oil, Butyrospermum Parkii (Shea Butter), Theobroma Cacao (Cocoa) Seed Butter, Vegetable-based Emulsifying Wax (Cetearyl Alcohol, Polysorbate 60), Citrus Paradisii (Pink Grapefruit) Oil, Phenoxyethanol, Caprylyl Glycol, Sorbic Acid, Citrus Aurantifolia (Lime) Oil, Citrus Medica Limonum (Lemon) Peel Oil, Citrus Sinensis (Orange) Oil. A Girl's Gotta Spa! Energizing Citrus Body Loton is Leaping Bunny certified cruelty free, Vegan and made in small batches, here in the United States. Absolutely free of Sulfates, Formaldehyde, Petrochemicals, Parabens, Synthetic Dyes or Fragrances, this is a lotion that you can feel god about using and sharing with your family and friends. 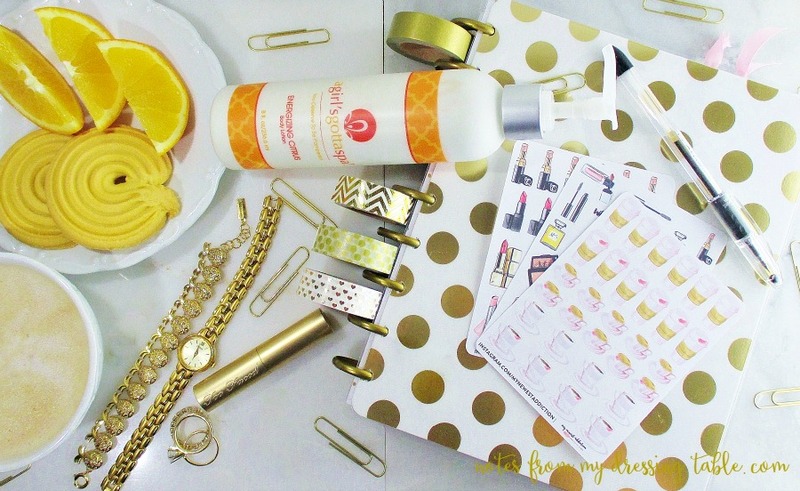 This lotion or perhaps an Energizing Citrus 3-Piece Gift Set would make a lovely holiday gift! Speaking of lovely gifts... Between 11/27/15 and 11/30/15 if you purchase a tub of A Girl's Gotta Spa Energizing Salt Scrub formulated with pure Mediterranean and Israeli Dead Sea Salt, Avacado Oil and Green Tea, you will receive a very special Gift With Purchase! A Girl's Gotta Spa! 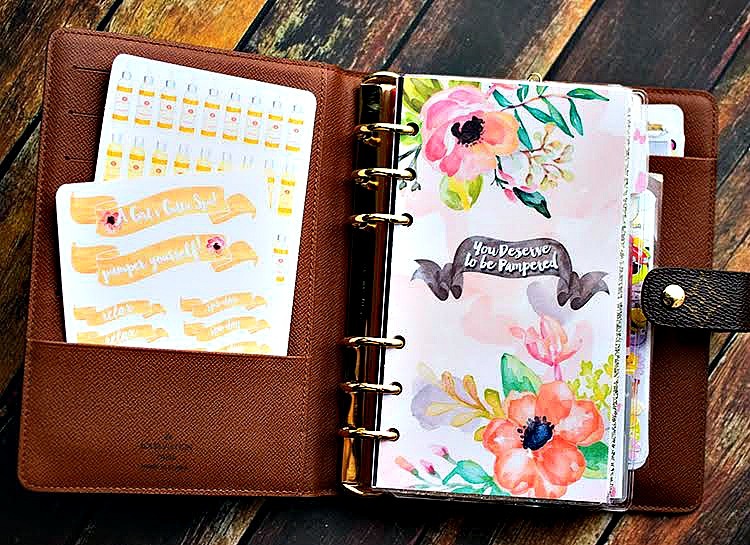 has teamed up with My Newest Addiction on Etsy and you will receive a beautiful floral personal sized dashboard with the daily reminder that "You Deserve to Be Pampered!" and spa and bath and body related sticker sheets. If you sign up for the A Girl's Gotta Spa! Newsletter, now you will receive a code for 15% off of your next order. You can use that 15% off to take advantage of the Salt Scrub/Planner GWP. My planner is the Me and My Big Ideas Happy Planner in Gold Foil Dots. Gentle reader, would you be interested in review, Plan With Me, How I Customize My Planner type posts? I am no perfect expert but I'm having a lot of fun with this and I'd love to share. Are you a fan of A Girl's Gotta Spa! and their gorgeous products? What are your favorites?